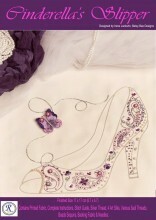 Own your own piece of the fairy tale with this stunning slipper designed by Irene Junkuhn. Using Rajmahal Sadi Metal threads in silver which brings out the gorgeous purple and pinks tones of the stitching. Each Kit contains printed fabric, backing fabric, stitch guide, complete instructions, Rajmahal Art Silks, Metal Sadi Threads, Rajord, beads,wire and needles. To learn more on how to Use Art Silk & how to Use Sadi Threads please follow links. Click the button below to add the Cinderella's Slipper Kit to your wish list.